As a contact lens wearer for almost 10 years, I think it is more cost-effective to get both dailies and monthly and wear them depending on occasions. At work, I still rely on my trusty pair of glasses but when I head out to the gym, I would put on my contact lens. During weekends, I would prefer to put on 1-Day contact lens especially if I am heading out for the whole day because comfort-wise, nothing beats wearing dailies where it gives you that all-day comfort without any irritations or dryness in the eyes. The reason why I probably still have not gone for a lasik eye surgery is because as a contact lens wearer, I get to ‘dress’ up my eyes with fashionable coloured lenses. I used to love wearing coloured contact lenses like dark grey and brown because it matches very well with my hair and skin tone but I often find that monthly coloured contact lenses are quite drying on the eyes after wearing for a couple of weeks. Thus, I prefer to go for 1-Day coloured contacts like the ones from FreshLook and Acuvue. Both brands of coloured dailies are comparatively good. But I have yet to try Acuvue’s latest 1-Day Acuvue Define which comes in three variations – accent style, vivid style and natural shine. And what really gets me excited to try this series of contact lens is how natural it looks on Asian eyes. It brings out a little glow to the pupils of the eye. At the same time, it defines and enhances the eyes naturally. Others wouldn’t even know that you put on coloured contacts to make you eyes looked intentionally big. Looking effortlessly beautiful is more enticing than anything else. Just so happens that Mr Lens, is having a special promotion on 1-Day Acuvue Define contacts from 1 August to 31 August 2015 in celebration of Malaysia’s 57th Independence Day. Mr Lens is one of the largest online contact lenses store in Malaysia that also offers prescription eyeglasses, sunglasses, branded and designer frames in addition to their wide selection of contact lenses by major brands. RM 75 per box of 1-Day Acuvue Define contacts! That works out to be about SGD35 per box of 30 lenses. A pretty good deal, isn’t it? Their website is quite informative and it is easy to navigate around. You could also view in your preferred currency to see if it is more cost-saving. However, the only disadvantage is the lack of close-up images of the lenses and pictures of how the lens would look when it is fitted onto the eyes. It would have been more convenient if there were more product images provided. Otherwise, googling for product images would do just as fine except that your fingers need to work a little more. It was a tough decision to make because I am torn between Acuvue Define Natural Shine (greyish tint) and Acuvue Define Vivid Style (brownish tint). Both contact lenses have a greyish or brownish gradient of colour which will draw more attention to the eyes. I just had to select the type of lenses, power and I am good to go! This process takes less than 5 minutes and it is so much more convenient for me as I don’t have to make a trip to the optical shop just to buy a couple of boxes of lenses. As I’ve opted for a DHL express delivery, my purchases was delivered to my doorstep came a day just right after I’ve ordered online. The contact lenses boxes were packaged neatly in a blue box. I guess one thing to take note when purchasing lenses online is to check the expiry date of the contact lenses especially if they are on sale. But the contact lenses I was given also expired in 2019 which meant that these lenses are manufactured not too long ago and I could keep these lenses for quite some time. I’ve worn Acuvue lenses before and when it comes to comfort and moisture level, they usually perform better than other brands. In fact, this beauty enhancement contact lens is coated with a locked-in wetting agent that creates a moisture cushion up to 20 hours! 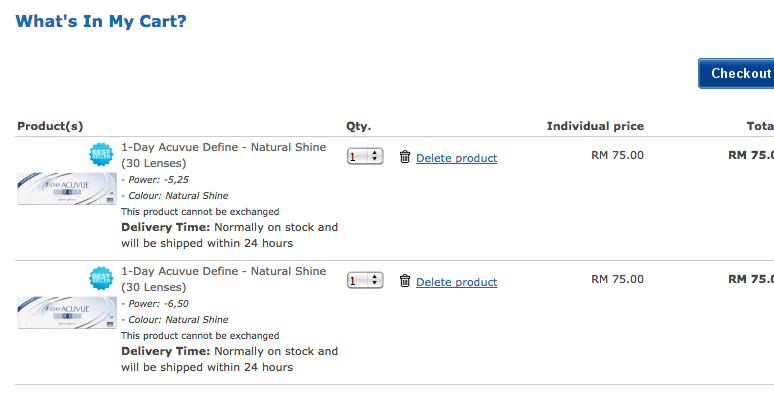 I’ve tried it on and I am glad that I’ve chosen Natural Shine as it really brightens up my eyes and made my eyes look sparkly. It looked natural even on photos too. These lenses also act like sunglasses, which protects your eyes against UV rays. This is one important feature to look out for because you wouldn’t want to suffer from eye cataracts, especially at an early age. For more information on 1-Day Acuvue Define lenses, visit this link here.